The Pokemon Go Valentine's Event is on and it means more candy, because Valentines, and pink Pokemon and longer-lasting lures, because pink. 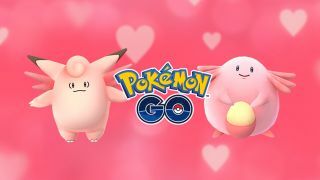 Developer Niantic confirmed that the event will run through 11 am PST / 7 pm GMT on February 15, the day after Valentine's. If your love for the game was starting to feel a bit stale and chalky like an old box of message hearts, I'm afraid this probably won't do much for you. Unless you're really into Clefairy love-ins. Meanwhile, these Reddit users noticed some disturbing trends among Pokemon sightings. Some folks are just happy that they finally have a better chance-y to catch a Chansey, of course. But overall this holiday event seems like a bit of a (milk) dud. I'm not one for empty complaints, so let me give Niantic some directions to improve in time for St. Patrick's day. Like, literal directions. Here's how to get from Niantic's offices in San Francisco to Blizzard headquarters in Anaheim so the Pokemon Go devs can ask for advice. What? Blizzard really knows how to do a seasonal event up good and proper.